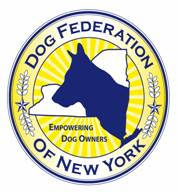 Do you know the NY State laws on dog ownership? Following are some of the outstanding features of current New York State laws which impact dog ownership. "Nothing contained in this article shall prevent a municipality from adopting its own program for the control of dangerous dogs; provided,however, that no such program shall be less stringent than this article, and no such program shall regulate such dogs in a manner that is specific as to breed". There are several communities in New York which retain BSL on their books. These communities, including Canajoharie, Hempstead, Hornell, Larchmont, Lyons, Newburgh, and Sands Point, are vulnerable to law suit by dog owners who are threatened with prosecution under breed specific statutes. "in a manner which a reasonable person would believe poses a serious and unjustified imminent threat of serious physical injury or death to one or more persons, companion animals, farm animals or domestic animals"
It is not necessary for a dog to have injured a person or domestic animal to be declared dangerous in New York. All dogs over the age of four months must have a valid dog license. State law allows animal control authorities to seize unlicensed dogs, whether on or off their owner's property. New York State has a "puppy lemon law". General Business Article 35-D covers the sale of cats and dogs by pet dealers, and includes remedies for purchasers who within 14 days from acquiring an animal become concerned about the animal's health. "Any person who owns or has custody or control of a dog that is left outdoors shall provide it with shelter appropriate to its breed, physical condition and the climate." This section of NYS law defines appropriate shelter and specifies penalties for owners and caretakers who fail to provide necessary housing. Article 26, Section 26A addresses "pet dealers", and defines a pet dealer as an individual or business that sells more than nine animals to the public for profit. Home or hobby breeders selling or offering to sell more than 25 animals born and raised on their property directly to the public are also considered "pet dealers" and are required to comply with standards of care specified in this section of the law, maintain records as specified, and are subject to inspection. In New York we have some of the most comprehensive legislation in the country regarding dog and animal fighting. In New York, fighting, possessing for the purpose of fighting, training, breeding or selling dogs (or other animals) for the purpose of fighting is a crime. Being a spectator at a dog fight, or being in possession of a dog where a dog fight has occurred is also a crime. Know the NYS law and how it affects you. For further details on any state laws concerning dog ownership, you can refer to the Consolidated Laws of New York. Your municipal clerk's office, whether city, town or village, should be able to advise you on local legislation.